MSC Cruises currently has 18 ships and is one of the youngest and fastest growing fleets in the cruise industry, with an impressive number of vessels on order up to 2026. 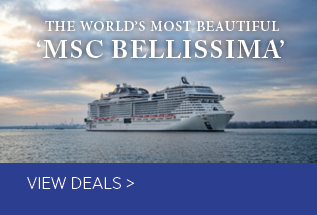 New ships include MSC Seaside and MSC Meraviglia, both launched in 2017; MSC Seaview, launched in 2018; and >MSC Bellissima, launched in 2019. MSC Grandiosa will launch later in 2019, along with >MSC Virtuosa in 2020. All MSC ships have plenty of facilities to keep the family entertained. 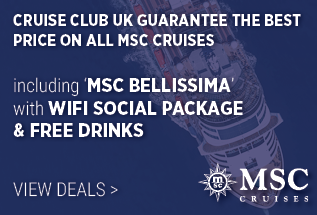 Highlights include the 96-metre central promenades on MSC Bellissima and MSC Meraviglia, which come to life at night; the glass walkway with views of the lower decks on MSC Seaview; swimming pool areas with giant movie screens; full-sized bowling alleys; and exclusive Cirque du Soleil shows. 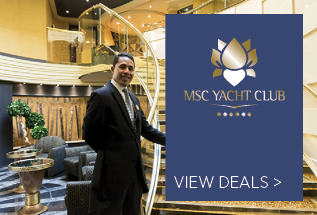 On select ships, you’ll also find the MSC Yacht Club, with accommodation and 24-hour butler service. Yacht Club guests can access a private lounge, restaurant and swimming pool, and also get complimentary access to the spa. The dining onboard is also a highlight, with lots of specialty options to choose from. Take your pick from steak at the Butcher’s Cut, a 3-course dinner in the Carousel Lounge before a Cirque du Soleil show or Italian-inspired cuisine at Eataly. Book an Aurea Experience or Yacht Club Experience and Drinks are always included! As seasoned cruisers or even first time cruisers, choosing the correct and perfect cruising experience for you can be very stressful, some people like to be specific amenities, be positioned near a certain location, or some will take pot luck and be allocated any kind of cabin from the cruise line, this is all down to each person’s personal preference. 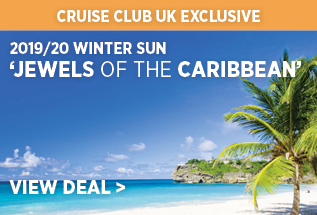 Below, you’ll see a description of the experiences and services each one has to offer with the fantastic MSC Cruise Lines. Discover a ship within a ship. A place where you can savour exclusivity and privacy in a world of choice. Where you can indulge in the luxury of a private club, while enjoying access to the myriad of recreation and entertainment possibilities that the rest of the ship offers. Luxurious accommodation and exclusive services are only the beginning. The MSC Yacht Club also boasts a range of superb private areas, from the elegant Top Sail Lounge with its panoramic views to the stylish restaurant and the One Pool Deck complete with private swimming pool, whirlpool baths, sun deck and bar.Created by renowned architects De Jorio Design International, each MSC Yacht Club Suite offers uncompromising luxury with a wealth of exclusive features. You can discover the luxury of MSC Yacht Club onboard: MSC Grandiosa, MSC Bellissima, MSC Seaview, MSC Seaside, MSC Meraviglia, MSC Preziosa, MSC Divina, MSC Splendida and MSC Fantasia Find out more.